You are here: Home / Night / Is This Something? I follow a certain blogger who sometimes opens one of his posts with the question “Is this something?” What he means is that he is tempted to consider the subject of the post important and intriguing, but he is also concerned that he might be letting his own prejudices get the best of him, or indulging in a personal hobbyhorse. This image is almost 3 years old. 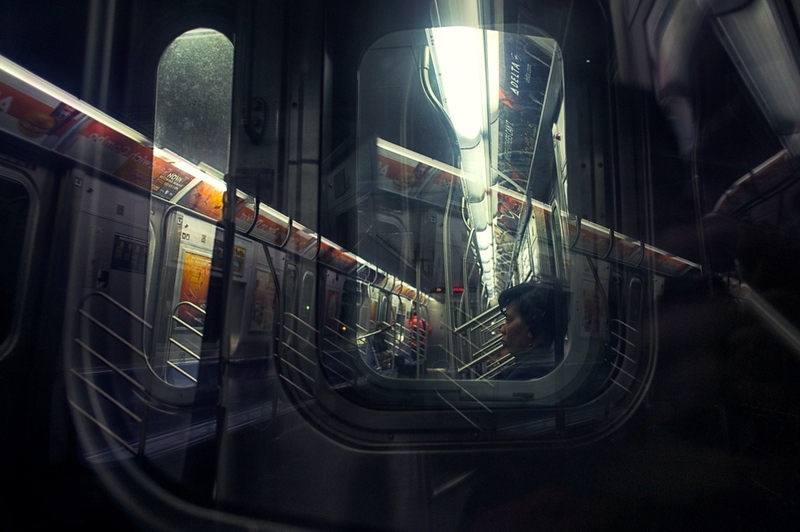 I took it at night on an elevated subway car pointing the camera through the window into the car in front of me, and I have long been intrigued by the effect created by the multiple windows and reflections. But I’m not sure if it’s something, or just a (not very hot) mess. Anyway, I stumbled across the shot last night when I clicked on this project by mistake and I decided to play with it a bit and throw it out there. This is a very interesting and cool image, Mark. I didn’t even see the people at first glance. I really like how the reflections and lines work to form a dramatic abstract. Those overhead, lighted signs are great leading lines. Nice job. Great abstract with lots of reality. I really like it. Great depth and wonderful framing of the main subject.